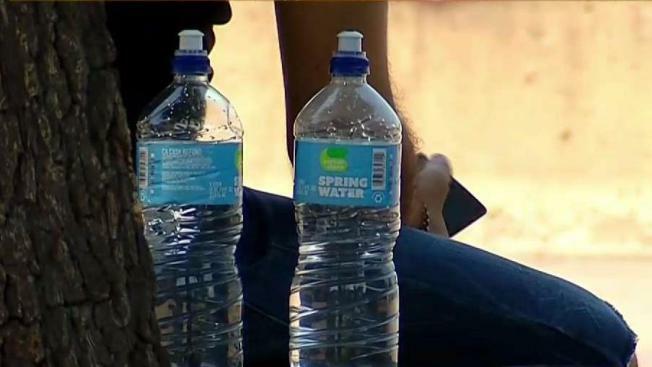 San Diego County saw some record-breaking heat on Wednesday and more is expected as the excessive heat warning issued for San Diego has been extended through Saturday, according to the National Weather Service. Amid rising temperatures, a thunderstorm near Jamul moved toward San Diego, according to the NWS. The mix of high temperatures and muggy rain created a monsoon effect across parts of the region. "It's pretty crazy, definitely being here in San Diego. We are not used to these types of really high temperatures," said Karla Nafarrate, a resident of East County. 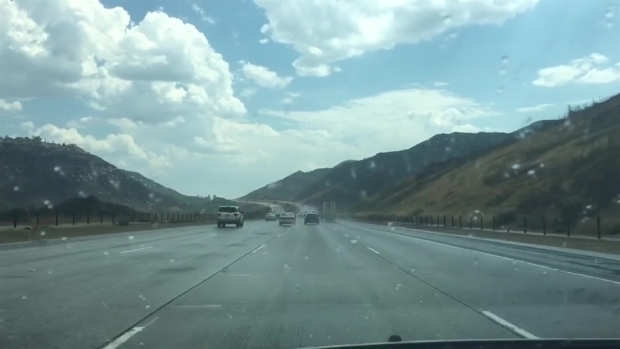 This raw video shows rain sprinkling in San Diego during a bout of muggy, rainy weather. A Heat Advisory is in effect for the coast and the mountain areas of San Diego County until 9 p.m. Saturday. NBC 7 forecaster Whitney Southwick said it will be hot and muggy, with a slight chance of a shower or thunderstorm in the deserts and mountains this weekend. There is also an Excessive Heat Warning in effect for the inland valleys and deserts until 9 p.m. Saturday. Temperatures will be about 10 to 15 degrees above average. A Flood Advisory is also in effect until 4:30 p.m. for north central San Diego County. Some locations that will likely experience flooding include Valley Center, Palomar Mountain State Park, Pauma Valley, Pauma Indian Reservation and Pala Indian Reservation, according to the National Weather Service. Forecasters advised drivers to turn around if faced with flooded roads. Most deaths occur in vehicles, according to the advisory. A statewide Flex Alert was issued for Friday afternoon by the state's independent system operator (ISO). According to Cal ISO, record power demands are expected Friday. Consumers were asked to conserve power during the late afternoon. That's when air conditioners are typically most used. In order to avoid power outages, the alert advised consumers to turn thermostats to 78 degrees or higher, turn off unnecessary lights, adjust water heaters to 120 degrees, use major appliances later in the evening or early in the morning and turn off pool pumps. Some San Diegans chose to stay indoors to beat the heat. "We are staying indoors, we are on staycation, and we have been choosing to do things where we can go inside and be in air-conditioning," said Katie Serbian, a resident of San Diego. On Thursday, there was hazy sunshine along the coast with warm and muggy weather in the low eighties. The valleys are mostly sunny, hot and humid, with a chance of a thunderstorm. Temperatures are 94 to 100 degrees. In the mountains, it's mostly sunny, muggy with a chance of thunderstorm and temperatures ranging from 88 to 93 degrees. In the deserts, it's even hotter with temperatures between 106 to 111 degrees. On Wednesday, Ramona tied its record high temperature with 105 degrees set in 1976. Campo broke a record with 107 degrees. The old record was 104 set in 2009. Temperatures in Borrego Springs also broke their record for the highest "over-night-low" ever recorded with 87 degrees. 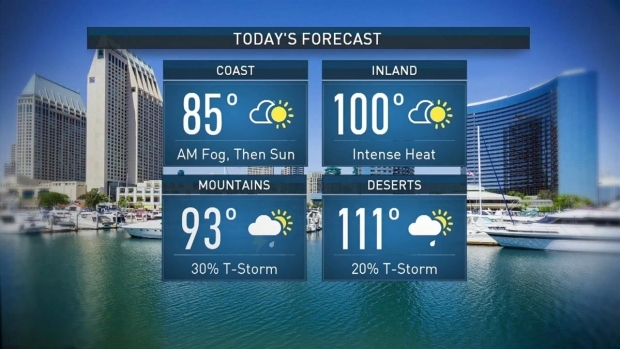 “And, there hasn’t been a lot of relief overnight, because humid air actually retains heat, and we have been very humid,” said NBC 7 Meteorologist Jodi Kodesh. Several communities set records for warmest nights including Palm Springs where temperatures dipped to 90 degrees. The previous was 89 degrees in 1998. Palomar Mountain set a record of 74 overnight, breaking the previous record of 73 in 2009. Temperatures are expected Thursday to reach the mid 90s to 105 degrees in communities like Escondido, El Cajon, San Marcos, La Mesa, Santee and Poway. People living in Borrego Springs, Palm Desert and Palm Springs will see temperatures above 110 degrees. Hot and humid weather will persist through the holiday weekend. Records will likely be broken again on Friday, as many areas will be hotter. The coast is expected to reach as high as 90 degrees on Friday. Inland areas could top 103. We will have to wait until the middle of next week to get a little relief. The City of Santee announced that the Santee Skate Park was closed Thursday and possibly Friday due to the high heat advisory. Hellhole Canyon, El Capitan and Mt. Gower were also closed through Saturday, according to the County's Parks and Recreation department. The biggest chance of thunderstorms in the deserts and mountains of San Diego County will occur Sunday and Monday. Temperatures will lower a few degrees by the end of the weekend but will remain above average.